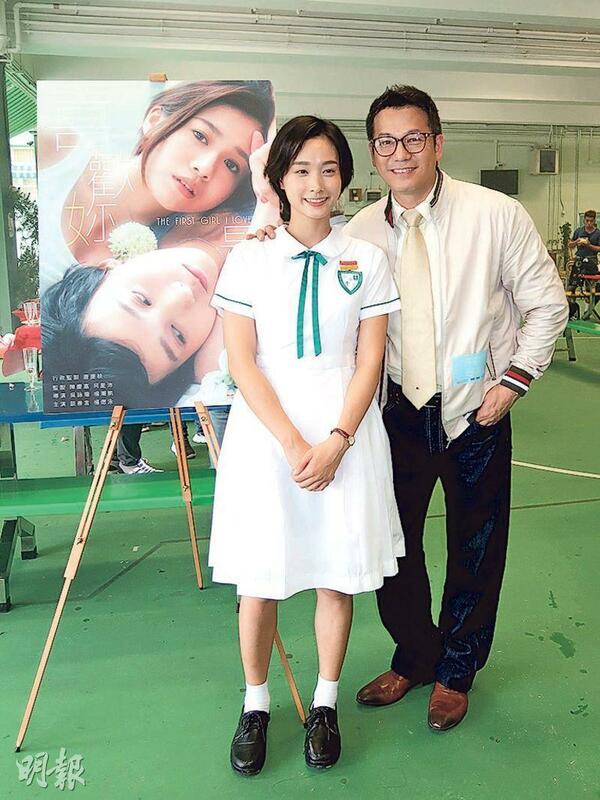 Hedwig Tam Sin Yin, Renci Yeung Sze Wing, Au Kam Tong and Mak Fong Kiu (originally named Teresa Mak Ka Kei) starred in the film THE FIRST GIRL I LOVED (HEI FOON NEI SI NEI), which held a production start ceremony yesterday in a Lan Tin school. Playing students, Tam Sin Yin and Yeung Sze wing held hands intimately in school uniforms. Tam Sin Yin has already left school for 10 years but in a school uniform without any make up she was no different from a school girl. She happily accepted the praise and revealed that in the film she and Yueng Sze Wing would have a relationship beyond friendship, have bodily contact but for now she could not revealed whether they would have any bed scene. Would love scene between two women be awkward? Tam Sin Yin said, "No, we already knew each other. We even shared a room. After the film we became even more familiar, we ate together, drank together, slept and did facial together. (Would a kiss with a girl be awkward?) No, instead I would worry about bodily contact with a guy. With girls I have no taboo." She said that Yeung Sze Wing was very popular with guys. Many male friends said that they were very envious of her and called her lucky. Au Kam Tong and Mak Fong Ku played Tam Sin Yin's parents. Au Kam Tong said that facing her daughter's difference in sexual orientation, he would maintain an open mind. Earlier he posted on social media about a Leisure and Cultural Services Department employee's threat against his drama troupe, Au Kam Tong said that the matter has come to an end. On the day of the post, the department contacted him for a meeting. Earlier he already met with two high ranking officials. They had an in depth exchange and he aired his own grievances and concerns. "They were very friendly, and apologized on behalf of that LCSD employee. For now I have accepted it, but I would keep an eye out for any change. My troupe and the LCSD are collaborators, I hope to have good communication."